I watched his tail lights all day. If he took the outside of the lane, I took the outside of the lane. If he sped up, I sped up. Watching intently, I didn't think, I just repeated everything he did. Fuji Joe was leading our tiny pack of four riders, with his gal Grand Diane behind him. I followed her and my hubs Highway followed me. Fuji was just far enough ahead in all of the turns to keep my eye on, mimic his riding, and get me through each twistie. I found that if I watch Grand Diane, I was too close and I had less reaction time. If I watched Fuji Joe, I looked all the way into the turn, using peripheral vision to watch the lane. That yellow line can be my savior and my nemesis, all in one. It keeps me safe, yet taunts me to stare at it. Not this day, because I was watching Fuji Joe. The ride from Fallbrook, CA on Route 76 and Route 78 to Lake Henshaw then on into San Marcos was filled with turns. From large, sweeping curves, those of an elegant woman's hip, stretching long and languid from waist to thigh, all the way to steep, tight, switchbacks, reminiscent of the angry arch of the elegant woman's brow. Gliding through the turns, I saw only Fuji's tail lights, and the graceful swing of Grand Diane's Harley occasionally pass between us. Knowing Highway followed me filled me with security that no one would sneak up behind. We rolled through the hills and turns, the roar of my tiny motor and Collective Soul belting tunes filling my helmet. Songs I know and love, unknowingly repeating the words I've sung so many times while repeating each movement Fuji made, I felt a focus I've never had riding before. The synchronicity of the four of us, the road, the bikes, the music we made as four bikes roared with one sound, filled my heart with collective unison. A Collective of Souls on eight wheels. . .
At The Round Up BBQ Grill in Lake Henshaw we stopped for a meal and to talk; discuss nothing and everything that has happened or will happen. We filled ourselves with iced tea from quart jars, pork and beef tacos, burgers and fries. The view was stunning, the food was good, the laughter lively and the communion harmonious. As we mounted up again and I joined the other riders, who are always ready to go before I am, a thought flashed in my head. "What if Fuji makes a wrong move? Will I simply follow him off a cliff?" I decided in that moment that I needed to follow guidance, but trust my own instincts. "You have to ride your own ride," Grand Diane shared weeks ago; good advice she learned from a friend of Fuji Joe. My body, my motorcycle, my ride; these are my responsibilities. Following good advice or good riding is smart, but what I do with that knowledge I gain is my choice. I can follow a good rider, but making a bad choice because he made one doesn't negate my responsibility. "Would you jump off a bridge if your friends did. . ." the old adage filled my head. I bopped Katie Scarlet into first gear and headed onto the highway behind my mentors and friends. 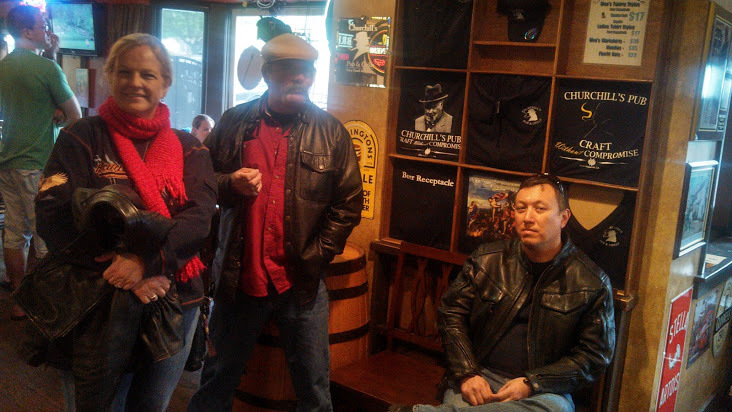 In San Marcos we found refuge and refreshments at Churchill's Pub. "You ride much better than you think you do. I don't know what you're talking about. You took those turns perfectly. Why are you worried?" Fuji Joe seemed puzzled. The gripping fear I feel in the pit of my stomach and the riding mistakes I've made have been topics we've discussed a few times. "I just followed you Fuji. I was going where you were going. I had it made. My destination was you, Fuji." I smiled. I'm glad you were able to follow another more experienced rider. It gives you a chance to observe and learn. The only danger is to ride beyond your abilities in order to keep up. If you slow down because it is too fast for you, the rider ahead will usually notice and slow down to your speed. Thanks Bob! I got no problem slowing down and making them wait for me. I'm a woman, for God's sake! People are always waiting on me!! I'm always the last one out the door, the last one to arrive. . . you get my drift. So slowing down to "my" safe speed is something I'm already comfortable with. If they lose me, well, they'll come back a'lookin'!! LOL! As far as a route, we don't and won't have one. We won't plan more than a week ahead. So you'll have to follow us on www.RoadPickle.com to see where we are headed next! I'm truly hoping our paths cross this summer Bob! So keep me updated on your trip. I would love to have you share Road Pickle on your blog! You're super popular and we would love some more readers. That goes for anyone else who has a blog! Bring your friends along!! The more, the merrier! It sounds like you enjoyed the day Ms Sash and I'm glad to hear that, and Bob Skoot is right, if you slow down the Leader should follow your lead if they don't let them go and pull out you GPS. That keeps you from riding beyond you capabilities and that's your responsibility. The friend that told Diane to "ride her own ride" calls that leading from the back. And believe it or not he taught me a lot about riding. Anyway I think your doing fine keep it up and I'd be happy to ride with you and Highway anytime. Keep the shinny side up.